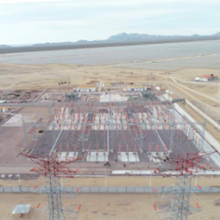 The Arteche Group has participated in the construction of the substations of the Puerto Libertad photovoltaic plant for Acciona as well as the switchgear substation that interconnects this plant with C.F.E., in Mexico. It is one of the most important renewable installations in the country, equipped with more than one million photovoltaic panels that are programmed to follow the sun's trajectory. Acciona has relied on the Arteche Group to participate in the construction of switchgear and booster substations, and for their integration into both the CENACE national transmission grid and the SCADAs of the photovoltaic plant. SAS Substation Automation Systems under the IEC 61850 standard have been used for this purpose, incorporating our saTECH range of equipment. In addition, Arteche has contributed with its wide experience in Power Quality as a result of more than 30 years executing projects in more than 30 countries. For the Puerto Libertad plant, several power quality studies were carried out, like power flows or transient recovery voltaje, to comply with the network code, and the open rack smARTop Capacitor Banks were used. This large project will cover the electricity demand of 583,000 Mexican homes, and will avoid the emission of 925,433 tons of CO2 to the atmosphere. The plant covers 10km2, of which 2.4km2 is capable of solar capture.